Quality wooden bar hangers in pink with white polka dot design. Top notches for garment loops & straps. Perfect hangers for trousers, suits, jackets, dresses, skirts etc. Flat space saving profile, takes up less wardrobe space. 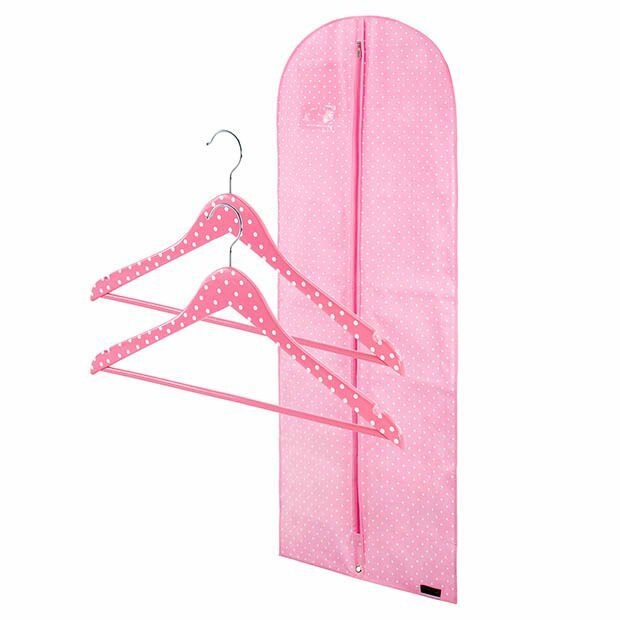 Pink with white polka dot design garment cover. Made from quality soft touch 80gsm breathable polypropylene material. Ideal for safe long-term wardrobe storage. Protects against dirt, dusts & moths. Useful internal secret zipped pocket for safe keeping of mobilles, makeup, jewellery, lingerie etc. Quality fulll length zip, shaped shoulders & top hole for hanger hook. Lower eyelet hole allowing easy carying when draped in half. All Hangerworld branded covers are guaranteed to be pH neutral ...acid free and colour run resistant. Size: Length 60" (152cm) approx.